No one wants to have pests in their home, mice especially. This time of year can be the biggest problem for them due to the cold temperatures and their need to nest over the winter. Many people have or are at risk of having rodent problem that they didn’t even know about. In honor of Pest Management Month we have put together a list of 10 facts about mice that will hopefully leave you better informed. Mice are a leading cause of electrical fires in the US – There are 16 million home and building fires in the US each year, of which around 8% of them are caused by mice gnawing on electrical wiring. Mice can gain access to a structure through a hole 6mm or smaller – Many people think that mice need a large hole to get into their house; however mice are capable of compressing their bodies to fix through even the tightest spaces, making exclusion (the process of filling holes and access points) a crucial part of treating for mice. 2 mice can reproduce to up to 15,000 mice in one year – Female mice lay about 15 liters per year, within 24 hours of giving birth, they are able to become pregnant again. The baby mice (or pups) are themselves able to reproduce within 6 weeks or less. Mice can survive up to 2 weeks without water – Mice get most of the water they need to live through the food they eat. Open water sources can still be an attractant to them and they will drink water if given the opportunity. 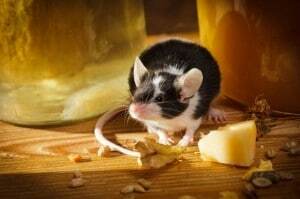 Mice carry many known diseases – Rodents have been known to spread 35+ diseases to humans. HANTAVIRUS, LYMPHOCYTIC CHORIOMENINGITIS and TULAREMIA are among some of the worst. This is mostly spread through their droppings and urine. Mice lay up to 100 droppings a day each – People don’t always realize the amount of droppings mice leave because mice are often in the walls or an attic. As these droppings dry out and break down, partials become airborne and are known to be a leading cause of respiratory problems in children and the elderly. Traps don’t always work right away – Classic snap traps are affective when treating for mice, but only when combined with other methods like baiting and exclusion. If mice have been in a home for a while they have memorized what obstacles they need to navigate around when running along a wall. If something new (a trap) is placed in their environment, it may them some time to feel comfortable enough with the trap to go for the bait. This is called “trap shyness” and is very common when dealing with mice. Having different options for treatment and a wide array of product to choose from is the best way to combat this. I have a cat, how can I have mice? – Though its true mice will stay clear of a cat’s path, mice are mostly nocturnal and are generally in areas of the house where a cat can’t get to… walls, attic..etc. On top of that, pet food is one of mice #1 food sources. Keeping your pets eating area clean and free of debris and crumbs will help limit their food source. Also keeping pet food and other goods in sealed containers won’t give them option of getting into the bag/box. If you have had mice in the past, you are more likely to get them again – When mice find a way into a property they leave a pheromone marker in their urine that acts as a guide for other mice to follow. They drag their tail though this urine leaving a trail throughout the home. Even if you eliminate the mice entirely, their sent trails may still be there leaving the home more susceptible to future problems. Maintaining an ongoing pest service is the best way to prevent against future rodent issues. Mice don’t leave your house when it warms up – We hear this a lot on the phone with customer “I only deal with mice in the winter; they just leave when it warms up”. This is a very common misconception and is not accurate. A home provides shelter, safety from predators, warmth, food and water. Mice have no reason to leave a home when it gets warm if they are already there. People that “get mice every year in the winter” actually have mice the whole year. The problem just gets worse later in the year because more come in due to the cold, making the mice seem like a winter only problem.